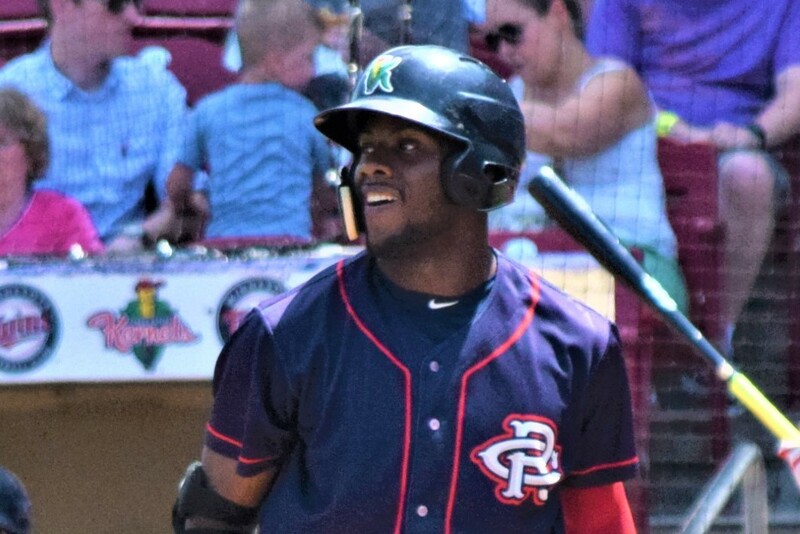 Ask Akil Baddoo about his mentality as the Cedar Rapids Kernels’ leadoff hitter and the young center fielder keeps it pretty simple. "Just score runs. That’s the goal and that’s how you win games." Of course being a consistently productive leadoff hitter at any professional level really is a little more complicated than that. You also won’t see Baddoo swinging at the first pitch often. His aversion to first-pitch cuts may not be quite as severe as the current leadoff hitter for the parent club Minnesota Twins, but at least in his first at-bat of the game, his approach does appear more than a little bit Joe Mauer-ish. Baddoo’s “just score runs” philosophy has translated to results on the field. Through Sunday’s 3-2 win at Wisconsin, Baddoo had crossed the plate a team-high 77 times for the Kernels in 2018. That’s 25 more than any of his Kernels teammates and only two players in the Midwest League have scored more runs than Baddoo this season. So how does a guy sporting a modest .238 batting average score so many runs? Indeed, Baddoo’s 10 home runs tie him with Ben Rodriguez for third most among Kernels this season and since both of the guys ahead of them on the list are now playing for the Ft. Myers Miracle, you could say they are the active team co-leaders. His 20 doubles also make him the “active” team leader in that category, tied with Alex Kirilloff and trailing only Royce Lewis and Jose Miranda – and all three have been promoted to Ft. Myers. Baddoo isn’t looking up at anyone on the triples list as his 10 three-baggers not only leads the Kernels, but the entire Midwest League. He’s stolen 21 bases, good enough for second among Kernels this season, and he would look to be in position to claim the team lead soon as he trails the departed Lewis by a single stolen base. And don’t forget the walks. With 69 walks on the season, Baddoo leads his team and ranks fourth on the MWL leaderboard. Not too bad for a guy who just celebrated his 20th birthday last week and is in his first year of full-season professional baseball. Baddoo was a Lottery Round B (74th overall) draft selection by the Twins in 2016 out of Salem High School in Conyers, Georgia – about 20 miles east of Atlanta. Unsurprisingly, perhaps, it took a while for a Georgia kid to adjust to the chilly Midwest as the season got underway, but as the weather warmed up, so did Baddoo. After hitting just .196 in April, he nudged that average up to .240 in May and his .245 batting average in June was accompanied by an OPS of .820. He followed that up by hitting .280 in July, again with an OPS north of .800 for the month. August has not been particularly kind to Baddoo, so it’s possible that the long season is catching up to him. His 105 games played is also a team-high number. Energy isn’t something the casual observer would ever think the dynamic Baddoo runs low on, but he’s also not all that concerned about his stat line. One thing we know for sure is that it’s not the Iowa summer, with temperatures through most of the past month running consistently in the upper 80s and into the 90s, that’s worn him down. With just two weeks left in the Midwest League’s regular season, Baddoo said he’s looking forward to the drive toward the postseason, but doesn’t want to change his approach down the stretch. Under the MWL playoff format, teams that finish first and second in each of the league’s two division during the first half of the season already have postseason spots locked up, while the remaining 14 teams battle for the four second-half qualifying spots. With two weeks left, the Kernels hold the top spot in the MWL West Division, but need to hold off at least two of Beloit (3 games back), Kane County (4 games back) and Wisconsin (6 games back) to earn a playoff spot. Baddoo’s smile lights up when the subject of potential for postseason play is the topic and he likes his team’s chances of making a deep postseason run. “Now we’re in a race. We’re in a race for the playoffs,” he said. “I kind of like it though. We have a great team, coaches that have prepared us for this moment and we’ve been playing great baseball lately. It’s the second straight season that Baddoo has been a part of a playoff contender, after playing for Appalachian League champion Elizabethton in 2017. Of course, that’s a pretty familiar refrain to Cedar Rapids fans who have heard about Rookie level championship rosters before, only to see many of the same players fall short of a Midwest League title the following year. Cedar Rapids hasn’t won the MWL since 1992. Baddoo hopes this is the year that trend changes. I can think of another toolsy outfielder from Georgia with a nice guy demeanor but fiery competitor who might be great mentor for him one day assuming Baddoo doesn't pass him in the minors (3/4ths joking). Is it just me or is does he look a lot like Kevin Hart in that top photo? I like Baddoo a lot and picked him as a future top 100 guy. I still like him but I am surprised his batting average is that low. I'm worried that all those strike outs are going to be a huge problem for him. This is pretty much every prospect but if Baddoo can just hit, he could be something. His eye and power seem legit. He's got speed. He could be a real nice corner OFer for us but not if he can't hit. Fantastic interview and article Buhr. I wonder if that BA would go up if he weren't so selective. Obviously trading walks for hits isn't going to impact the OBP but it might help with the strikeouts. Hard to say in the Midwest League though, there's probably significantly fewer strikes thrown on the first pitch at that level than there are at each level onward. I could say some things about the strike zones of MWL umpires, but it's not like they're unfairly picking on Baddoo. Every batter has to deal with it. That said, I'm not TOO concerned about the modest batting average yet. Some guys hit .240 because they can't hit breaking balls or have trouble ever really barreling up a ball. That is not Baddoo. As his XBHs would indicate, he can hit the ball hard. He hit something like .350 in 30+ games at E-Town a year ago. I'll just wait to see what happens in Ft Myers next year. What I didn't really get into in the article is the way his defense has improved since the first of the year. He's worked with Dinkelman and Mike Quade (Twins' minor league outfield instructor) on getting a better first step and running better routes and the improvement has been notable. Great guy, hard worker and some raw talent. Nothing there not to like. Akil's game is going to age really well. He's clearly a student of the game and that OBP is going to play really well next to Lewis and and kirilloff. I remember words like “raw” and “toolsy” getting thrown around a lot when the Twins drafted Baddoo, so I’m especially impressed that such a young player has such a mature approach to the game. Sounds like he’s got a lot of self awareness, and I love that he’s focused less on immediate results and more on a process that will lead to good results for both himself and his team. I'll just wait to see what happens in Ft Myers next year. Couldn't agree more with the article Steve.The point on waiting to see what happens in Fort Myers nails it.He could really show his clutch ability come playoffs and grow more off of that, but for the most part, he needs to be challenged at the next level.I compare his eye to LaMonte Wade's.He's stronger and more athletic than Wade, but Wade was more advanced through college ball. I'm excited for Baddoo and am really wanting him to doing well at the next level. On a side note, it was great to meet you down in Cedar Rapids a couple weeks back vs. Beloit.